The players within the global iron oxide pigments market are concentrating their efforts on organic growth strategies. The last few years have seen a heightened demand for these pigments which has resulted in players looking to capitalize on this trend. Many companies are also looking for expansion of their manufacturing facilities. For instance Lanxess has encompassed its milling and mixing plant to its existing pigment plant in Ningbo, China. 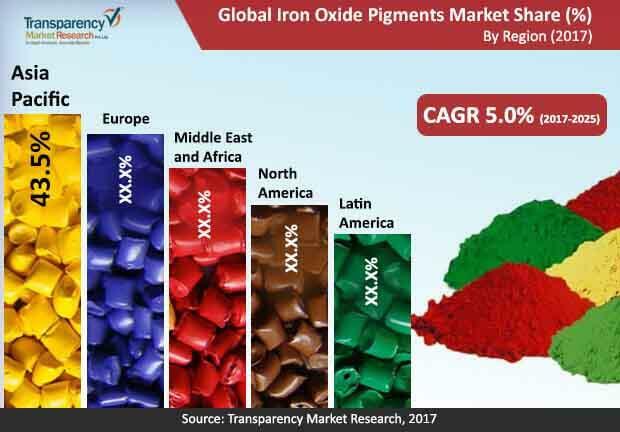 Companies within the market are becoming increasingly responsible towards the environment and therefore many of the companies are producing eco-friendly pigments as well as making use of eco-friendly and cost-effective manufacturing processes, states Transparency Market Research (TMR) in its latest report on the global iron oxide pigments market. Key players operating within the market include: Huntsman Corporation., Cathay Industries, Hunan Three-ring Pigments Co., Ltd., E.I. du Pont de Nemours and Company, BASF SE, Lanxess AG, and Kronos Worldwide, Inc. According to TMR, the global iron oxide pigments market is will be worth US$1,951.8 mn by the end of 2025. In terms of type, the demand for synthetic iron oxide pigments will be higher than natural iron oxide pigments on account of their cheaper rates, good dispersibility, and high tinting strength. In terms of colour type, the red colour pigment will be much more in demand as compared to any other colour, followed by the yellow colour pigment. On the basis of geography, the Asia Pacific will lead in the iron oxide pigments market. The region accounted for 43.5% of the market in 2017. In terms of end user, the construction sector will be the largest consumer of iron oxide pigments. The construction industry is thriving all across the globe, and especially in emerging economies of Asia Pacific. As per a TMR analyst, “the rise in the number of construction and infrastructure building activities worldwide, but especially in developing nations, is the primary reason fuelling the demand for iron oxide pigments. The increasing initiatives taken by governments in developing nations for urbanization is also benefitting the market for iron oxide pigments. The investments by governments towards infrastructure development will push the demand for iron oxide pigments. The demand for these pigments will also rise from the plastic industry.